A remote controlled drone plane carries the Albanian flag over the pitch during Serbia's Euro 2016 qualifier against Albania in Belgrade. The Court of Arbitration for Sport (CAS) has awarded Albania a victory over Serbia, and in so doing, overturned Uefa sanctions imposed after a drone was flown into a stadium. 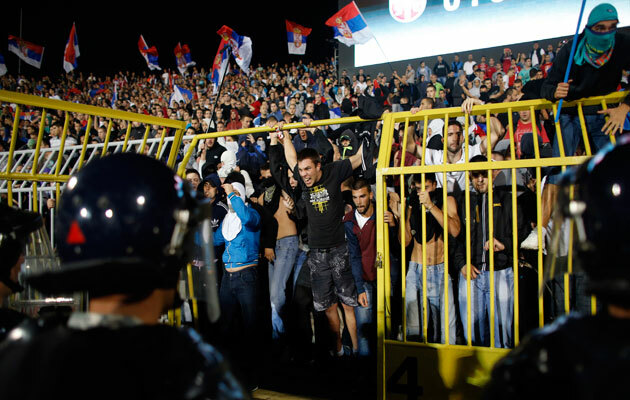 The Euro 2016 qualifying match in Belgrade in October 2014 was abandoned with the score goalless after fighting broke out between players, fans and team officials on the pitch of the Partizan Stadium. The brawl came after the drone carrying a flag bearing an insignia of “Greater Albania”. 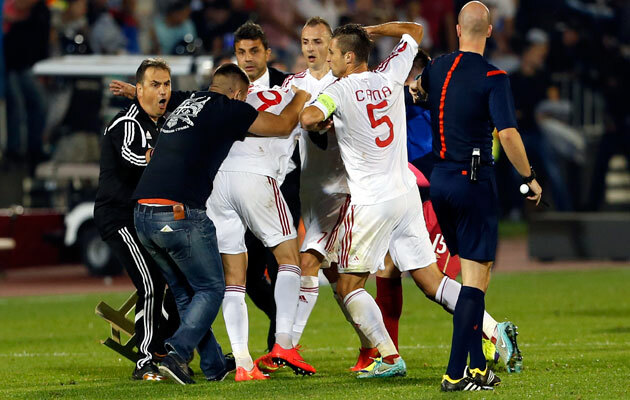 Uefa ordered Albania to forfeit the match, while Serbia were given a 3-0 default win. However, Serbia were also deducted three points and ordered to host two qualifiers behind closed doors. Both countries were fined €100,000. CAS rejected the appeal filed by the Serbian FA, but upheld in part an appeal filed by Albania’s FA. CAS ruled that Serbia were responsible for the game not being completed, and confirmed their deduction of three points – while also awarding Albania the 3-0 win. It means Albania are now level on 10 points with second-place Denmark in Group I, which is led by Portugal. Serbia are at the foot of the group, with minus two points. Albania’s FA will still have to pay their €100,000 fine after CAS said that “the FAA was responsible for the drone operated during the match, carrying a banner depicting Albanian nationalistic and patriotic symbols”. The countries are scheduled for a return match in Albania on 8 October.